Our story-telling traditions often make a big deal out of family and descent. Part of the classic Campbellian Hero’s Journey is the son’s need to measure himself against his father. A Real Princess™ can tell when there’s a pea under a dozen mattresses, or needs a Real Prince™ to wake her up (apparently princesses do a lot of napping). Modern stories often reinforce the importance of true family lines in similar ways, whether they’re directly invoking the mythic tradition (like Star Wars) or just because family is still an important part of the drama of our lives ( like Harry Potter). The idea that family lines determine our characters’ stories, abilities, and ambitions is such a big part of our narrative legacy that it can seem like a primordial principle of storytelling, but in fact these kinds of stories arise from specific cultural contexts. These contexts have to do with the assertion of class. Small-scale societies historically tended to be egalitarian. When a culture contained only a few hundred people, everyone knew one another personally, resources were freely shared, and there was no real differentiation between rich and poor, powerful and powerless. As societies got larger, up into the range a few thousand people or more, social distinctions tended to emerge because people were no longer held together primarily by personal and family relationships. In societies of this scale, some families acquired more resources and more influence than others. Over time, these differences hardened into class distinctions, with prosperous families asserting their own superiority over the less fortunate. An aristocratic class with a sense of its own importance took shape. A rising aristocracy, however, often struggled against the older traditions of egalitarianism and mutual support. To maintain their position, aristocrats had to create and disseminate a new ideology which justified their status. In many societies all over the world, this ideology was framed by stories about heroic ancestors and special powers passed down through family lines. If you weren’t part of the family line, you didn’t inherit the special powers, and therefore you didn’t deserve to be rich or powerful like them. Many of the ancient stories that have been passed down and become part of our common narrative tradition were stories originally told by and for aristocrats and would-be aristocrats clawing their way into positions of privilege. When ancient Greek bards recited the tales of Achilles, Odysseus, Helen, and Penelope, they weren’t just telling stories to entertain the masses. Bards and singers depended for their livelihoods on the support of aristocratic patrons, and the stories they told were propaganda for the people who paid the bills. Greek aristocrats claimed to be actual descendants of the heroes of the Trojan War and other myths. The Homeric epics are quite clear that no one from outside the family line deserves to get anywhere near the heroes’ wealth and power. On the other hand, our story-telling traditions also include narratives that are democratic (or at least anti-aristocratic). Some of these take the form of “clever peasant” tales in which someone from an unimportant background gets the better of the rich and powerful through luck, audacity, and wits. These tales often set up the aristocrats as buffoons who are humiliated in the end and forced to acknowledge the individual merits of people with no family claim to riches or power. Stories of this type are common in folk traditions, including English Jack tales and their analogues in other cultures. Another type of story combines elements of both, often revolving around a lost heir or disguised royal. In these stories, the hero at first appears to be an ordinary person whose individual initiative and skill earn them acclaim and awards, but they turn out in the end to be the misplaced scion of an important family. Sometimes these lost heirs know their own identity and are in hiding; other times they are themselves unaware until their true identity is revealed. 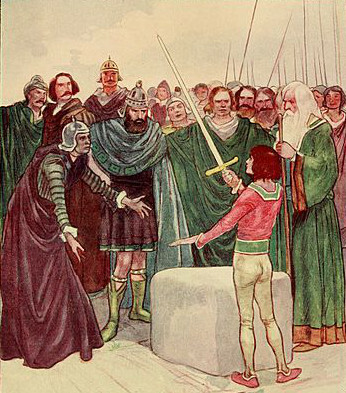 King Arthur, in some versions of the Arthurian mythos, fits this pattern: having been raised in obscurity, he comes into his true heritage when he proves his special powers by pulling the sword from the stone. Robin Hood—again, in some versions—represents a different take on the same pattern: by rights a nobleman, he hides his true identity and fights for the common people. This tradition represents a degree of compromise between the aristocratic and anti-aristocratic narratives. The hero acquires something of the common touch and has to get by on individual merits, but the aristocratic claims to a unique status remain unchallenged. Star Wars has always been told in the mode of myth, but myths don’t come out of nowhere and they aren’t just stories. Myths are stories that mean something. If Star Wars is going be meaningful in the world we live in today, it’s time to democratize the Force. We need more clever peasants these days, not more lost heirs. We like to think of the modern world as one in which different cultures intertwine and overlap with one another, but there were complicated cross-cultural interactions in the ancient world as well. For example, look at this wall painting from an Etruscan tomb. 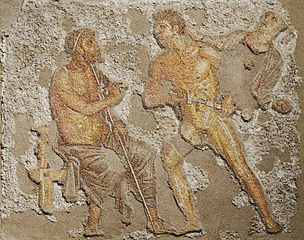 This scene depicts an incident from the Trojan War. After his friend Patroclus was killed in battle, the great Greek warrior Achilles went mad with grief. He piled up an enormous funeral pyre for Patroclus, on top of which he also killed twelve Trojan prisoners. At the center of this painting, Achilles slits the throat of a naked Trojan prisoner while a Greek soldier leads another prisoner to the slaughter from the right. To the left, the ghost of Patroclus, in a blue cloak with a bandage over the fatal wound in his chest, looks on in dismay. This incident comes from the Greek legends of the Trojan War and is mentioned in the Iliad, but it is a rather obscure scene. It was rarely, if ever, referred to in later Greek literature or depicted in Greek art. The fact that an Etruscan artist could use this event as the basis for a tomb painting demonstrates a more than passing knowledge of Greek myth. The Etruscans were a people of northern Italy who had extensive trade contacts with the Greeks and imported large quantities of fine pottery and other Greek luxury goods. They also imported Greek legends and stories, which they frequently depicted in their own artworks. 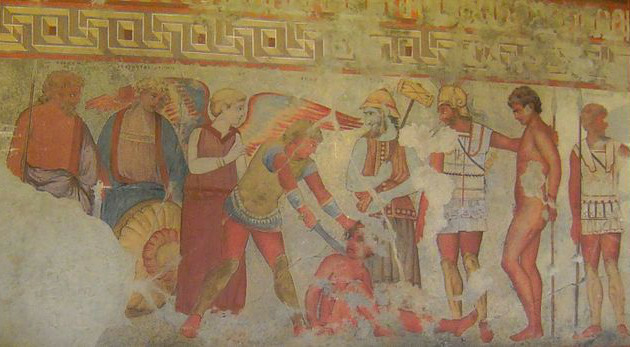 Like the painting in the François Tomb, Etruscan art often picks up on obscure or unusual incidents that were not widely depicted in Greek art. 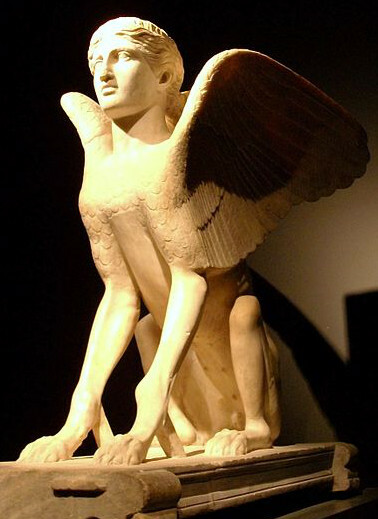 This selectiveness tells us that Etruscans were not just copying the Greek art that they acquired but were making conscious artistic choices based on extensive knowledge of the Greek material. This painting also adds some uniquely Etruscan elements to the scene. The winged woman directly behind Achilles is Vanth, an Etruscan goddess whose role seems to have been to decide the fate of the souls of the dead. The blue-skinned man to Achilles’ right is Charu, another Etruscan god who led the souls of the dead to wherever Vanth decided to send them. Vanth and Charu are purely Etruscan characters with no basis in the Iliad. Greek myth had figures who performed similar functions, but they looked nothing like Vanth and Charu. This painting is one that a Greek artist would never have painted and that a Greek viewer wouldn’t have understood. It only made sense to an Etruscan, but to an Etruscan who knew their Iliad well enough to recognize the figures of Achilles and Patroclus and identify the moment in the story that was being depicted. Here in this image we have a moment of cross-cultural interaction on display. The notion that ancient monuments, myths, and artworks reflect the visitation of Earth by alien beings is not one that is taken very seriously in the world of scholarly history, nor much outside of it, either. Still, it is one of those fictions, like astrology or the vaccines that cause autism, that continue to float through popular culture and appeal to some people because they offer simple answers to difficult questions. Who built the pyramids? Who drew the Nazca lines? Aliens! It’s easy to dismiss ancient aliens as just another silly idea that most people don’t take seriously, but even silly ideas can be insidious. How we think about people in the past shapes and is shaped by how we think about people in the present. Especially when we’re looking to the past to inspire works of speculative fiction, we have to be conscious of the assumptions that underlie our ways of interpreting and explaining history. 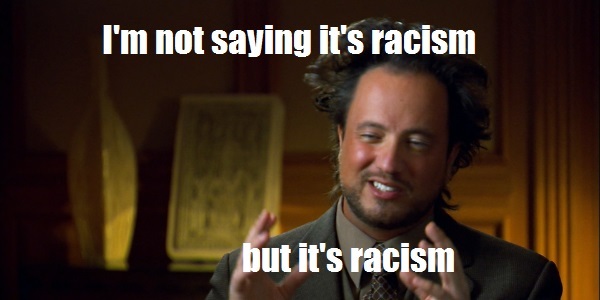 As harmless and even goofy as the ancient alien hypothesis may seem, it operates on a logic that is fundamentally racist and entangled with imperialist ideology. I’ve written before about the dynastic race theory of Egyptian history. In brief, Europeans of the eighteenth through early twentieth centuries didn’t believe that Africans were capable of creating an advanced civilization on their own, so they invented a superior race of foreign invaders who they believed had conquered and ruled Egypt, bringing their advanced culture with them. This theory justified European imperialism by creating a historical precedent: the brown people of the world needed superior white rulers to teach them how to be civilized, both in the past and the present. The racism and imperialism inherent in dynastic race theory is obvious to us today, but the ancient alien hypothesis rests on the same assumption: that those people couldn’t possibly have been capable of creating such sophisticated artworks, monuments, and cultures on their own. Although ancient alien crackpots can conjure little green men to explain anything from the past, you’ll notice that the popular examples are all things created by non-Europeans: the pyramids of Egypt, the temples of the Maya and Aztecs, the Nazca lines, the Rapa Nui (Easter Island) stone heads, and so forth. You don’t often hear arguments that aliens built the Parthenon in Greece or the Cathedral of Notre Dame de Paris. But, some might say, that’s just because we know who built the Parthenon and we don’t know who built the pyramids, so the alien hypothesis is just filling in a mystery. Except that we do know. Egyptians built the pyramids. Mayans built the Maya temples and Aztecs built the Aztec temples. The Nazca people created the Nazca lines and Polynesians erected the stone heads on Rapa Nui. We have a pretty good understanding of how and why they all did those things, too, even if we’re still piecing together some of the details. None of this has ever seriously been in doubt. There is no mystery, just a reluctance on the part of white westerners to acknowledge the cultural attainments of non-white non-westerners. No aliens need apply. The ancient alien hypothesis does much the same work for a modern audience that dynastic race theory did for an earlier one: it reassures us descendants of European imperialists and colonizers that the peoples our ancestors conquered, subjugated, and destroyed weren’t really up to snuff anyway. They didn’t build great monuments, figure out sophisticated mathematics and physics, or organize labor on a massive scale, space aliens did it for them. They didn’t compose great works of literature and mythology, they just handed down hazily-remembered stories about men from the sky. Invoking ancient aliens saves us the trouble of respecting other peoples’ cultures or acknowledging the tragedy of their destruction by assuring us that they don’t really count. We have a responsibility to the people of the past and to our audience in the present. False interpretations of history have underlain some of the worst atrocities that human beings have committed against one another. We have a duty not to perpetuate harmful assumptions, even when they come dressed up like silly alien stories. This duty lies upon us even when we aren’t doing serious scholarly study and are just mining history for interesting storytelling material. The stories we tell matter. This doesn’t mean that ancient aliens are off-limits for storytelling. I have no doubt that there are good fantasy and sci-fi stories to be told about aliens visiting Earth in the past, stories that don’t deny the agency, ingenuity, and persistence of ancient peoples. Let’s see some of those. One of the hallmarks of modern storytelling is toying with the conventions of a genre. Familiar stories get retold with surprising twists and the tropes that everyone can see coming are turned upside-down and inside-out. It’s not just a modern game, though. Older stories can be just as cunning with their twists. When I’m trying to think about how to do something different with a familiar tale, one of the examples I look back to is Euripides’ tragedy Medea. 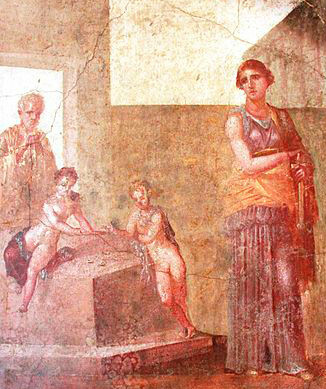 Medea is one of the classics of ancient Greek theatre. There are plenty of good translations available and it’s not hard to get your hands on one. If you’re looking for an online edition, here are a few. I discussed the play before in comparison to Star Wars, so I won’t bore you with summarizing the whole plot again (check the link if you want a quick reminder). Rather, I want to talk about two interesting things Euripides does with the story. Myths, legends, fairy tales, and other stories passed down through the generations are at the root of our storytelling tradition. They are the earliest stories in our literature and some of the first stories we learn as children. It is no wonder that we keep going back to mythology looking for deeper meanings. The drive to find hidden meaning in myth leads to some misguided interpretations. Two common mistakes are Freudian theory and the “forgotten history” theory. It’s well known that George Lucas drew inspiration from mythology when writing Star Wars. Luke Skywalker, the young hero from the planet farthest from the bright center of the universe, gets the call to adventure delivered by droid and goes off on a Campbellian journey to rescue a princess, seek out an ancient mentor, and finally confront his fallen father. The prequel trilogy gave us the tragic version in which Anakin, the great warrior, was driven to madness and destroyed the things he loved the most. There are smaller touches of myth throughout the Star Wars hexalogy. Luke receives his father’s lightsaber like King Arthur drawing his father’s sword from the stone. The escape from the imperial garbage masher has hints of Jonah and the whale. Luke in the Wampa’s cave has shades of Beowulf. Like most of the rest of geeky internet, I’ve been watching the trailers for The Force Awakens with excitement. I’ve been struck by something, especially in the latest trailer. The mythology that this latest iteration of Star Wars is working hardest to evoke is… Star Wars. Star Wars has transcended being a movie franchise or even an expanded universe. It has reached the point where we can speak of it in terms of mythology. One of the definitions of myth is that it is a story you know even if you can’t recall ever being told it. Star Wars has that. It is part of our cultural consciousness to the point that even people who haven’t seen the movies (yes, they exist) recognize the sound of a lightsaber and the cadences of the imperial march. Star Wars was all over my childhood, and even though I didn’t get around to seeing the movies until I was a teen (I was a Star Trek fan and young and dumb enough to think that I had to pick one over the other), I recognized Darth Vader, Princess Leia and Yoda on my friends’ lunchboxes. Another characteristic of myth is that all myths are versions. There is no original, no canon. Though some may disagree on whether this is a good thing, Star Wars has always been an evolving story, getting new versions from small tweaks to big changes. (Yes, I see you in the back in the “Han Shot First” shirt, you can put your hand down.) The new wave of Star Wars movies leaves the old hexalogy alone but reboots the post-Return-of-the-Jedi expanded universe. For those of us who grew up in the world of Star Wars, it is hard to imagine a time when these stories were not a part of the popular culture, yet there was a time when no one had heard Darth Vader’s breathing or Yoda’s grammar, when no one knew what a lightsaber or a Death Star was. By connecting to the ancient stories we already knew, Star Wars made itself feel timeless. Now it has become a part of that universal memory to be played upon and invoked in its own right. Norwegian Theodor Kittelsen (1857-1914) developed into one of Scandinavia’s most popular artists. He’s especially well known for his nature paintings and illustrations of fairy tales, legends, and trolls. 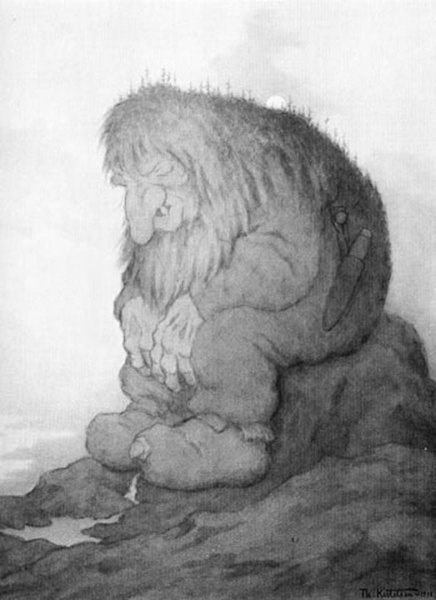 Theodor Kittelsen: Trollet som grunner på hvor gammelt det er [troll wonders how old it is], 1911. Via Wikimedia Commons. His art clearly shows how strongly the Norwegian nature inspired him. Kittelsen’s style is said to include aspects naturalism, mysticism, and Art Nouveau. 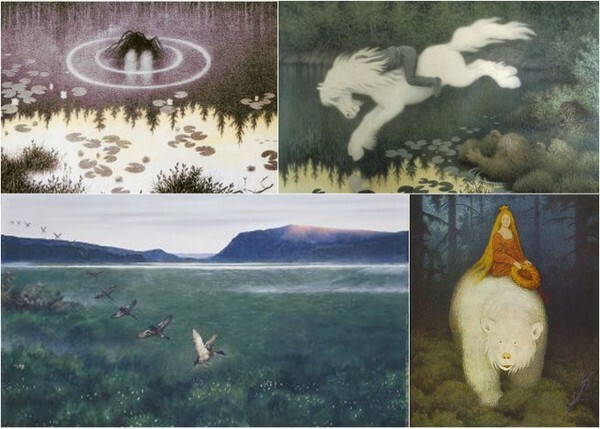 Theodor Kittelsen, clockwise from top left: Nøkken [water spirit], 1887–92; Gutt på hvit hest [boy on white horse]; Kvitebjørn Kong Valemon [white bear King Valemon], 1912; 12 villender [12 wild ducks], 1897. Via emmeffe6 on Flickr (one, two, three, four). The element of a boy on a white horse is connected with water spirit tales. Apparently some näkki water spirits (to use my native Finnish term) can turn into horses to capture humans to pull underwater. I don’t remember that aspect of the näkki stories from my childhood; perhaps there’s a difference between the Scandinavian and Finnish tales. The landscapes in Kittelsen’s paintings remind me of the Finnish wildernesses a lot. There’s also something solemn and contemplative in the mood of his imagery that makes me connect it with Tolkien’s art and writing, on one hand, and, on the other, with the illustrations of Tove Jansson (see examples of her work on Alice in Wonderland and The Hobbit provided by The Official Moomin site). One of my weaknesses as a writer is dialogue, particularly dialogue that needs to carry subtext. I’m not good at writing the kinds of things that people say when they’re not actually saying what they’re saying. When I need inspiration for how to write a scene in which people say one thing while really conveying something else, the place I look is the argument between Achilles and Agamemnon in book 1 of the Iliad (lines 101-244). There are a lot of good translations of the Iliad available if you want to check it out. I’m especially fond of the Robert Fagels translation for the strength of its poetry. Richmond Lattimore’s version is good if you really want to get close to the rhythms and patterns of the original Greek. The translation on Perseus is older and less readable, but you can pick up the scene I’m talking about around the middle of this page (start after ). There are plenty of other choices. To set the scene: As the Iliad opens, the Trojan war has been going on for ten years and has come to a stalemate. The Greeks are not able to breach the high walls of Troy while the Trojans cannot dislodge the Greeks from their camp on the shore. To break the impasse, the Greeks have begun trying to put pressure on the Trojans by raiding the smaller towns nearby that are allied with Troy. One of these raids carried off a young woman, Chryseis, who was awarded to Agamemnon as his prize. Chryseis’ father Chryses, a priest of Apollo, comes to the Greek camp to ask for his daughter’s return, but Agamemnon refuses and sends him away. Chryses prays to Apollo for aid and Apollo obliges by spreading plague through the Greek camp. After ten days of suffering, the Greek kings gather together to discuss the situation. The seer Chalcas reveals the cause of Apollo’s wrath.